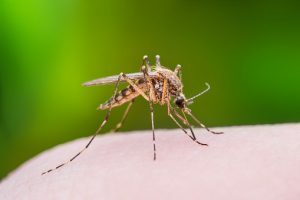 When you are searching for Washington D.C. mosquito control companies that safely wipe out your mosquitoes and ticks, call on the professionals at Complete Lawn. We are a comprehensive lawn and landscaping service that has been keeping Washington lawns healthy and beautiful since 1972. Our mission is to keep your lawn and landscape beautiful and mosquito-free. As you surely know, the mid-Atlantic climate is extremely conducive to mosquitoes, with warm and often humid springs and summers. Recently, a major pest control company ranked Washington D.C. in the top 20 for mosquito problems. Mosquitoes and ticks not only bring pesky bites that irritate skin, they can be carriers of more serious diseases and health risks. At Complete Lawn, we execute a thorough and ongoing pest control process. Our trained and licensed professionals will inspect your property and recommend ways to keep insects out. We can apply a specialized BT product near standing water areas and spray the perimeter of your property, focusing on popular insect gathering spots such as underneath decks. Afterward, we leave a glue card that keeps track of further insect activity. Our process will help keep your lawn and outdoor space virtually free of mosquitoes and ticks, and it does so without using dangerous chemicals that cause health risks for you and your neighbors. Our sprays are environmentally friendly, enough that you and your family can use the property immediately. And we fully stand behind our insect control problem; if you experience any problems within five days, call us and we’ll re-spray your property immediately. Stop swatting away annoying and uninvited mosquitoes on your property. Contact Complete Lawn today to get a price quote and see what makes us the top choice in Washington D.C. mosquito control companies. We’ll keep your lawn healthy, green and safe.